Set against a rambling creek bed, The Mill offers six luxury, self-contained apartments in the centre of Clare. Incorporating comfort and convenience, our accommodation is ideal for those visiting the beautiful Clare Valley for a relaxing escape or business. Located on the Main Street of Clare The Mill Apartments provide a perfect base from which to discover the Clare Valley. 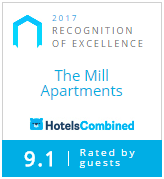 Just minutes walk from restaurants, cafes and local shops The Mill combines luxury and comfort with the practicallity of a self contained kitchenette. Complimentary wine and generous breakfast provisions are provided for guests. The Mill Apartments include both one and two bedroom apartments with private balconies over looking the Hutt River, kitchen facilities and designated car parking. Each of our apartments underwent a complete refurbishment in 2016.